The only way is up - but a ladder needs to be appropriate for the job. At Brewers we believe in helping our customers get the best results; if you’re happy then we’re happy! Setting us apart from the competition is our independence and therefore ability to provide impartial advice to our customers regarding all manner of decorating products. We’ve compiled some valuable advice regarding ladders and access equipment from a wealth of experience and sources. For all portable ladders and step ladders being used on construction sites, the HSE (Health & Safety Executive) require that they meet the standards of BS 2037 Class 1 or BS EN131 – but what does this actually mean? 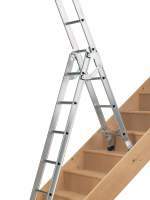 There are 3 grades for ladders and step ladders in the UK classified by use, strength and durability. Each grade is part of BS 2037, the British Standard for aluminium ladders, and bear the Kitemark. The most relevant for the professional decorator is BS EN131 as it covers ladders and step ladders constructed from aluminium, steel, plastics or timber and therefore likely to apply to the ladder you have in your van. Described as a ladder for ‘trade and light industrial use’ i.e. low frequency and used in less onerous conditions, with a duty rating of 115kg (18stones) this is the class that your ladder should meet. If you’re not sure whether your ladder meets the BS EN131 standards, contact the manufacturer or look for the Kitemark. · BS2037/BS1129 Class 3 which is for domestic use, making it applicable only to our customers who are keen DIYers. Choosing the right ladder can make the job a lot easier and safer. There are a wide variety of ladder types available, as you can imagine this is due to the widening working at height regulations and advancements in product development helping to provide access equipment that is suitable for a diverse range of situations. The key access equipment types are listed below, this should help you identify which products you might require – if in doubt, contact your local Brewers branch who will be able to guide you in the right direction. These provide access for jobs that don’t really require a ladder, just a handy leg up! Easy to assemble and fold down again, it is something that most decorators will use on a day to day basis. 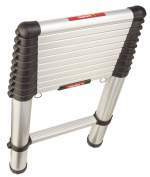 With choice from a varying number of treads, the step ladder is a common ladder used in the trade – generally lightweight yet sturdy it is great for most jobs. This type of ladder will allow you to select the appropriate height required as they can be adjusted depending on the job. There are double and triple extensions, the latter suiting jobs with higher requirements or simply easier transportation on a smaller vehicle. A particularly innovative piece of equipment, a telescopic ladder (evolved from the traditional extension ladder) will collapse down to around a meter or less in its closed state but can reach around 4 meters when extended. A neat piece of equipment for a small van! As the name suggests, a combination ladder can be assembled in a number of different ways making it suitable for a variety of tasks. Many combination ladders have a configuration that makes them suited for use on stairs. 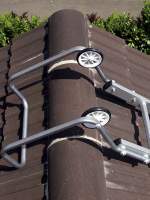 These ladders are adjustable in height but are supplied in a number of sections to easily fit in smaller vehicles. Plus, they allow the user to change the height depending on the job in hand. Working on a roof demands equipment that you can rely on. Roof ladders come fitted with strong hooks to steady the ladder giving you peace of mind that you are safe and stable! These come in a variety of heights and offer the most secure and stable way of working at height, however they’re not appropriate for every job. Their size makes them particularly suited to external or industrial work. Remember whichever type you choose, it must meet the BS EN131 classification, buying your equipment from Brewers means that you will be safe in the knowledge that your ladder meets the specifications. Brewers has a diverse selection of ladder accessories available. A selection of Werner ladders and steps are available from every Brewers branch, however other brands can be supplied on request such as Youngman. To make your life easier when up a ladder, we supply a range of accessories. These include roof hook kits, ladder stays, ladder locks and rack clamps, plus Werner’s Lock-In System which customises your Holster top ladder for the job in hand. 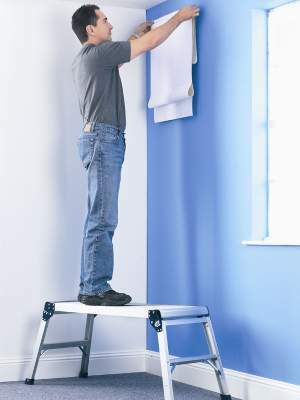 Particularly handy are their paint cup and disposable liners which lock in to the top of the ladder, freeing up your hands for added convenience and of course safety! Keep checking the Brewers site for trade events happening at your local branch; Werner are often in attendance with their experts on hand to give advice regarding the right ladder to use, tips for working at height, information about their products plus demonstrations. For those professionals seeking further specific advice and support, Werner offer Ladder Training at their Training Centre. Being Ladder Association approved, this is an ideal way to get yourself and your team up to speed on ladder safety. If you have any questions or queries, please do not hesitate to contact us on help@brewers.co.uk or at your local branch.